Adventures in the Endless Pursuit of Entertainment: Let's make Harriet Walter homesick again. 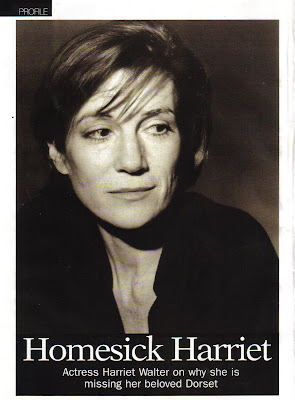 Let's make Harriet Walter homesick again. Just as the Summer of Harriet Walter was coming to an end, I had reason to correspond with my friend Darrell who lives in Dorset, England. I was raving about Mary Stuart(as usual) when he shamefully admitted that he didn't know about Mary Stuart, Harriet Walter or even Janet McTeer! Take him to the tower! 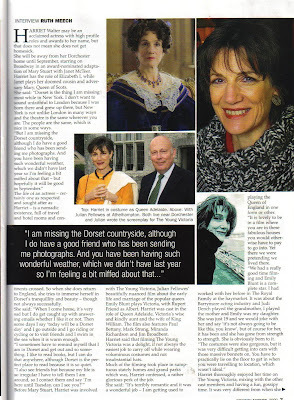 But, he learned his lesson quite quickly when Dorset Society magazine arrived in his mailbox and he turned the page to find Harriet Walter staring at him. Serves him right. But he did redeem himself when he posted the magazine to me. Ah, it's lovely. Sadly, Harriet was homesick for her home in Dorset. I can't blame her - Dorset looks splendid. However, I'm in favor of making her homesick again. Harriet, please come back to Broadway very soon. Come back Harriet Walter, come back!! Janet McTeer is terrorizing 85th Street with a lead pipe and only you can stop her!